These cookies are kissed with the warmth of maple and brown sugar and a hint of cinnamon. They are big and chewy and oh so good! Today's post is really special to me. I get to share with you two things that are important to me. The first, of course, is cookies. We all know my sweet tooth is larger than life. But the second thing is a cause that is near and dear to my heart, childhood cancer research. Don't worry, we'll get back to the food soon enough. First we need to talk about something WAY bigger. Childhood cancer is one of those things we don't like to think about. Such an ugly disease has no place in the lives of our special little people. In fact, it was something I didn't used to give much thought to either. To be honest, I would shed a tear at the St. Jude specials when they were on T.V. but it always seemed so far away. Then cancer came to town. It came in the form of a lump on the belly of a friend's two year old. A lump found on Christmas of all days. A lump that encouraged a visit to the emergency room and then a long ambulance ride to St. Louis. That lump turned out to be hepatoblastoma, a rare form of pediatric liver cancer. All of the sudden childhood cancer wasn't something they did fundraisers for on T.V. All of the sudden it was something real. It was with awe that we watched our friends and their family fight cancer. We were also in awe as we watched our community come together and support them. Luckily 6 months of chemotherapy and a big scary surgery later he had no evidence of disease! But if you know any little cancer fighters, you know the battle doesn't stop there. Less than four percent of cancer research dollars fund pediatric cancer research. So our littlest fighters just get mini doses of adult therapies. The problem is our little people aren't mini adults. They are still developing and growing. So the very treatments they are getting to save their lives now can have scary side effects down the road. So there is always the worry the cancer will come back. But there are also worries over the long term effects of what they went through to save their lives in the first place. There can be issues with teeth, cardiac problems, hearing loss and even infertility. Then there is the risk that those very drugs that were used to kill the original cancer could cause secondary cancers later on. That is why we owe it to these little fighters to do more. They don't deserve the disease but they most certainly deserve better treatments. That is why when OXO reached out to me about baking cookies as a part of a larger fundraiser for childhood cancer, I couldn't say yes fast enough! Two of OXO's employees started Cookies for Kids' Cancer after their son was diagnosed with cancer. It is amazing how what started as a bake sale to fund research for better pediatric cancer treatments has grown. Of course OXO is a big supporter of the cause. In addition to donating money for each blogger who is baking cookies and sharing them virtually, they are also matching funds raised at bake sales across the country. I am grateful to be a little part of it. Whew! I could probably go on about this subject for days, but I know you want to hear about the cookies as well. 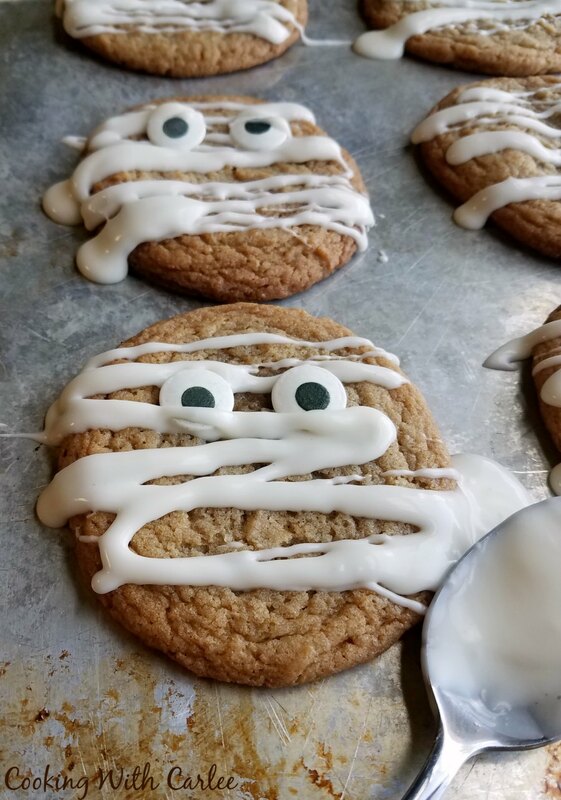 These cookies are chewy and delicious!! They are kissed with that warmth of brown sugar and maple. There is something about those flavors that taste like a warm hug! While maple syrup is actually more of a late winter early spring product, it still feels like fall to me. I can't be the only one, right? Anyway, I tossed in a little bit of cinnamon for good measure and it really all blended together so well. The dough is really easy to make. Either start with super soft or melted and cooled butter and you can do it all in a bowl with a spatula. Follow that up with a nice chill in the refrigerator and you will be ready to go in no time. 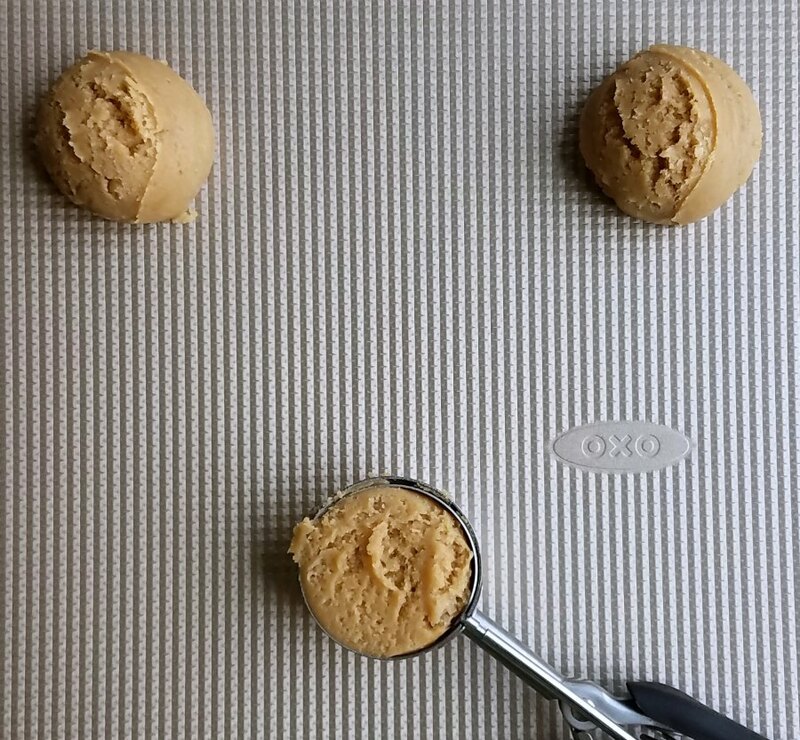 I used my large cookie scoop to make the balls of dough. Can I tell you a secret? I've broken every cookie scoop I've ever owned. Usually within the first couple of uses. Not that OXO one! I've had it for at least a couple of years and it's still ticking... and certainly not for lack of use! No need to flatten the dough out. It they will do its thing in the oven and come out just perfect! They will flatten and puff up while baking. You will want to pull them while they are puffy and the edges are just starting to take on some color. They will fall a bit as they cool and that is what gives you those slightly crisp edges and the perfectly chewy centers. SO GOOD!! Since I love all of the OXO products I own, I was not surprised to be blown away by their non-stick pro cookie sheet. It has a nice heavy duty feel to it and micro-texture helps your cookies bake evenly. I was a little worried about throwing dough full of sticky maple syrup on the sheet with no parchment or anything, but they came right off! The silicone cookie spatula was the perfect tool to move them with. They were kind enough to send me a cookie press as well and I am super excited to try that out. I already have an idea I hope to share with you soon! The cookies really were great on their own. But you know me, I couldn't resist the urge to throw some sort of frosting on these bad boys. So I whipped up a quick glaze. 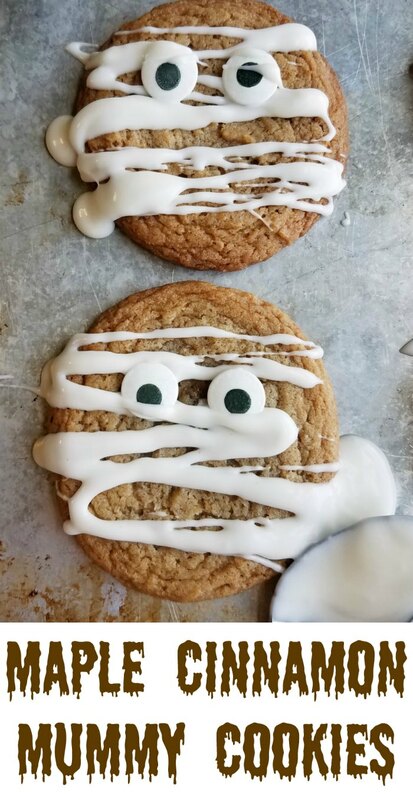 I drizzled some back and forth over half the cookies and added eyes for quick and easy mummies. The rest got a quick schmear of glaze and a few sprinkles for a more all season feel. I love to bake cookies and certainly don't do it enough. I always think of monster cookies this time of year as they were a favorite after school snack and cinnamon brown sugar roll-out cookies are a great fall cookie was well! 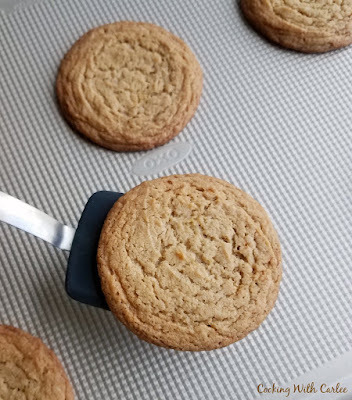 What are your favorite cookie recipes and tools? In a large bowl, stir together butter, brown sugar, maple syrup, vanilla, maple extract and egg until well mixed. In a separate bowl stir together the flour, baking powder, baking soda, salt and cinnamon until mixed and free of clumps. Add dry ingredients to wet ingredients and stir until combined. Refrigerate for at least a half hour. 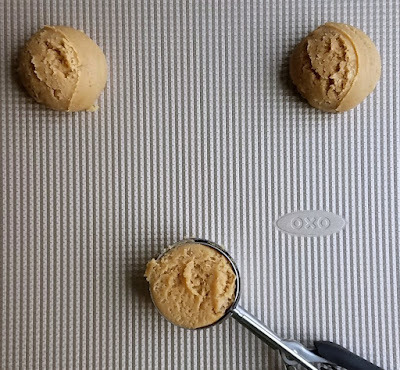 Scoop 3 T of dough at a time onto non-stick cookie sheets (or regular cookie sheets lined with parchment paper). Alternatively, roll about 3 T of dough into a ball about the size of a golf ball and place on cookie sheets. Be sure to leave plenty of room for spreading, these cookies end up being almost 4" in diameter after they are baked. Return remaining dough to refrigerator while the first set bakes. Bake for 12-14 minutes or until the edges start to turn golden and the centers are puffed up. Cool completely on cookie sheet before removing. Repeat with remaining dough. If you want to glaze them, just mix together the powdered sugar, vanilla and enough heavy cream to make a thick glaze. Drizzle or spread as desired. What an amazing cause. We know this awful disease. Unfortunately one child we know lost their battle but another recovered. That's why we need to raise money like this...to continue saving more and more!! 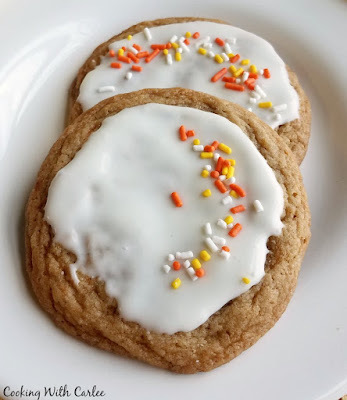 LOVE these cookies, you had me at cinnamon and well, cookie!! Happy Monday sweetness!! Hi Carlee, what a clever way to raise funds for childhood cancer! A virtual fundraiser of sorts. Cancer is such a nasty disease at any age, but I can't begin to imagine what it must be like being a parent to a child what has cancer. It makes me sad just thinking about it. I hope your friends little one remains cancer free! OooOOo I love cinnamon cookies and I know where I can buy maple syrup here too, not sure about the extract though, but I'd just use vanilla. Love your little 'Mummies' you are getting into autumn mode. The maple extract is definitely not necessary, I just wanted to make sure the maple syrup really came though without adding so much syrup that they'd be a sticky mess! I am definitely starting to think autumn, now if only Mother Nature would start to think it too! I'm so glad your friends' son is OK! Childhood cancer is so terrifying. This is such an important cause to support. Your cookies sound completely wonderful, Carlee! Have a great week! It is definitely scary and unnecessary if you ask me! If only we could find a way to do without it forever! Thanks, Kelsie! What fun cookies. And such a good cause. Childhood cancer is so difficult. It just tears at my heartstrings when I see or hear of such things. Thank you for supporting this cause. And thank you for sharing this wonderful cookie recipe! It's definitely not a fun thing to think about, but such an important cause anyway! I think I may have to plan a bake sale next year in support of the cause! It is definitely a terrible disease no matter who it is affecting! Thanks so much, Michelle! Carlee, couldn't love this recipe more. Not only cause it looks so yummy, love crisp edges with a gooey center, and the brown sugar and maple syrup sounds like a perfect combination. But also love that these are in honor of such an important cause. Kudos to you and OXO! Thank you so much, Nikki! It was an honor to play such a small part in such an important campaign. They really are, Megan. Thank you! I just love these cookies as the "Mummy Cookies"!! I will definitely be making these this Halloween. Thank you, Tracy! They are so simple to make and really make them festive for Halloween! They look amazing! I'm sure they taste even better! They were so delicious! Thank you, Andrea! What a great cause! Glad to read that your friends little one is a survivor! These cookies sound fantastic, and my cookie friend that goes crazy for cinnamon will love when I bake these! It is definitely scary and helpless to watch a little one fight like that. I can't imagine how I'd be if it were my own child fighting. I hope you love the cookies! The whole house smells amazing while they are baking! 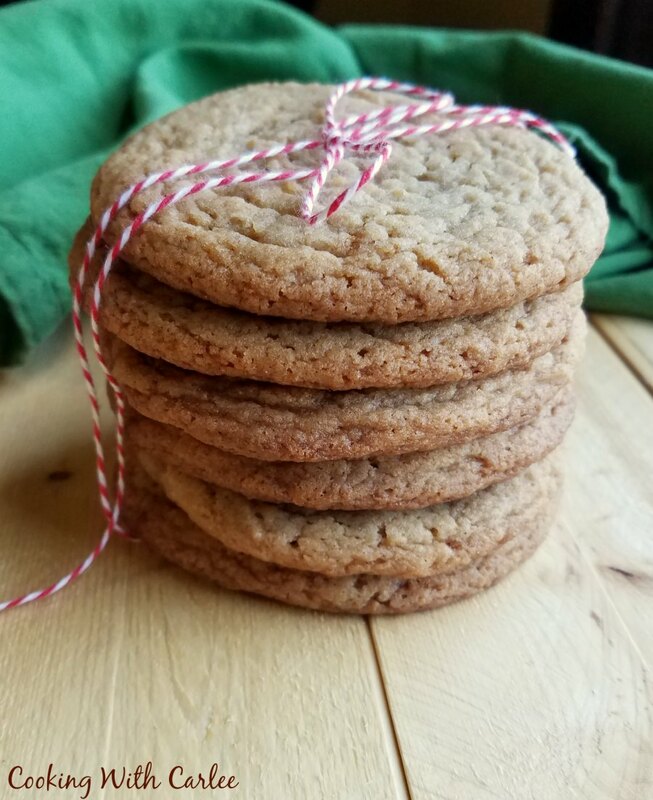 Your Chewy Maple Cinnamon Cookies really need to be in my cookie jar! Thanks so much for sharing with us at Full Plate Thursday. Have a great weekend and come back to see us real soon! They definitely would, Miz Helen! Thank you! During the season of pumpkin everything, it's great to find a recipe that has hints of fall that isn't pumpkin! :) Thanks for sharing at Snickerdoodle, Carlee! Pinning. Ha! That is true. I do enjoy pumpkin baked goods as well, but it does get a bit much sometimes! I can't tell you how much I love this recipe! I WILL be trying it! Maple, Chewy?... So glad you shared this litte gem at our Celebrate365 Cookie exchange!